SIMUL8 comes with a stringently tested* and commercially established PRNG (Pseudo Random Number Generator). However we recognize the desire in some communities to use their own PRNG, or a particular academic generator. 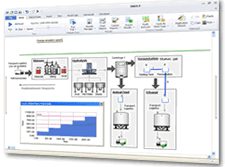 Since 2006 SIMUL8 has supported replacement of its own generator with any coded in a DLL. For instructions on coding your own see the help files. To use a common academic one download and unzip into your c:\program files\SIMUL8 folder one of the files below. Check the box in file\preferences for "Use external Random Number Generator". If you create your own and it has been validated via published academic research in a recognized quality academic journal please sent it to join the list above. * many academic teams have used it as an example to test their testing methods and all tested used have shown our generator to match all criteria for randomness.